A cross-country road trip provides plenty of opportunities to create art.A cross-country road trip provides plenty of opportunities to create art, whether it’s snapping photos of America’s purple mountain majesties or doodling in purple crayon on diner placemats. For those seeking additional art, travelers just need to make a few detours to see some surprising stops scattered across these great states. To start mapping out an art-filled itinerary, plug the coordinates of these destinations into the GPS system. As if designing the Guggenheim wasn’t a big enough contribution to the world of art, Frank Lloyd Wright created his own architectural masterpiece in the form of Fallingwater. Nestled in the mountains of southwestern Pennsylvania, this house lives up to its name as it stretches over a 30-foot waterfall, giving the illusion that it’s not built on solid ground. Fallingwater was constructed between 1936 and 1938 to serve as a weekend house for the owners of Kaufmann’s Department Store in nearby Pittsburgh. Today, the house is open to the public and is recognized as a National Historic Landmark. Along with a deep history of deep-dish pizza, Chicago also has a deep appreciation for the arts, as evidenced by the city’s Millennium Park. Opened in 2004, this 24.5-acre portion of Grant Park contains a combination of sculpture, architecture, and landscape design. Perhaps the most popular (and the most Instagrammable) piece is Anish Kapoor’s “Cloud Gate,” a stainless steel sculpture nicknamed “The Bean” because of its shape and beloved by tourists because of its selfie-ready reflective surfaces. Also reflective is the Crown Fountain, a design by Jaume Plensa that consists of a reflecting pool placed between a pair of glass brick towers. Projected onto each of these 50-foot towers are video images of faces representing 1,000 real Chicago citizens of all ages and ethnicities. Cawker City, Kansas may be home to the world’s biggest ball of twine, but another Kansas town has the honor of displaying the world’s largest art easel. In the small city of Goodland, the Sunflower State proudly represents its nickname with a giant reproduction of a masterpiece made by fellow sunflower lover Vincent van Gogh. Measuring 24 feet by 32 feet, this supersized recreation of “Three Sunflowers in a Vase” rests upon an 80-foot-tall steel easel that is easy to spot from nearby I-70 and proves to be an unexpected sight in the never-ending flatness of the Great Plains. “Somewhere a portion of contemporary art has to exist as an example of what the art and its context were meant to be,” wrote artist Donald Judd. That “somewhere” is Marfa, Texas, and that “example” is the Chinati Foundation. Opened by Judd in 1986, this collection of large-scale art installations covers 340 acres of land that once made up Fort D.A. Russell. Today, the former fort’s artillery sheds and army barracks house a permanent collection of sculptures and concrete and aluminum works with each artist’s work installed in its own building. The museum’s grounds also host temporary exhibits of modern and contemporary art. 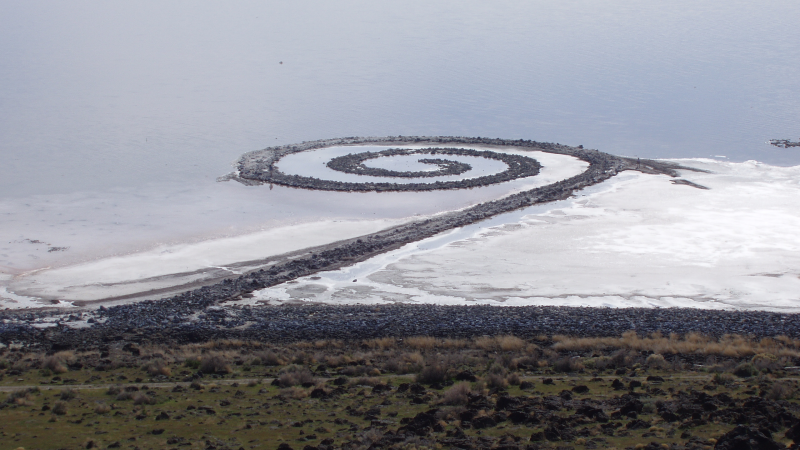 Along the northeastern shore of the Great Salt Lake, what looks like a natural landform is actually an earthwork sculpture called “Spiral Jetty.” Constructed by Robert Smithson in 1970, this stunning structure contains over 6,000 tons of black basalt rocks and earth, forming a counterclockwise coil that winds off the shore into the water and measures 1,500 feet long and 15 feet wide. Along with being advised to not to disturb the rocks and vegetation, guests are also reminded to check the lake’s varying water levels since the jetty isn’t always visible above the water line. Jenna Briggs is a writer and editor living in New York City. She currently manages editorial operations for a global market research company. Her freelance work has been published in The Philadelphia Inquirer, IdealBite.com, and other publications.